How do people resolve problems? Nearly a fifth of British adults with legal problems do not seek professional advice, a government study has revealed. Only 9% use mediation and conciliation. 79% had not considered it at all. Therefore it is obvious from this survey that mediation has a long way to go in persuading people that it is a viable and attractive option for people to resolve their disputes. The researchers classified some of the legal problems being ignored as “not very serious” but said that many had “a significant negative impact on the adults experiencing them”. 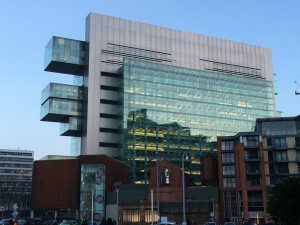 The survey – conducted by the Ministry of Justice – was published recently in 166 pages of findings. It claims to show that “knowledge” is a key influence on people’s behaviour when dealing with legal problems. “Being able to access and understand information about possible options is an important influence in how people try to resolve their legal problems,” the report said. It added that “individual capability and confidence” were key factors, “with some people able to fully understand the available resolution options, and therefore able to either handle their problems using only self-help sources or know what kind of professional help would be suitable and know when and how to access it”. Others, the researchers said, had much lower levels of understanding of legal issues and were therefore “discouraged from trying to resolve their problem”. Overall, 9% of adults with legal problems had used independent conciliation, mediation or arbitration, 11% considered using it but ultimately decided not to, and 79% did not consider using it at all. Of those who had not used independent conciliation, mediation or arbitration, around a tenth (12%) of adults said they had considered using mediation but had decided not to, with 88% not considering this at all. This varied, however, by the type of legal problem, with over a quarter (28%) of those who had a relationship breakdown problem saying they had considered using mediation, and around a fifth of those with an education or employment problem saying this (19% and 18% respectively). There was little variation according to problem characteristics, although adults who had experienced adverse consequences as a result of their legal problem were slightly more likely to say they had considered using mediation to help resolve their problem than those who had not had any adverse consequences (16% compared with 9%). 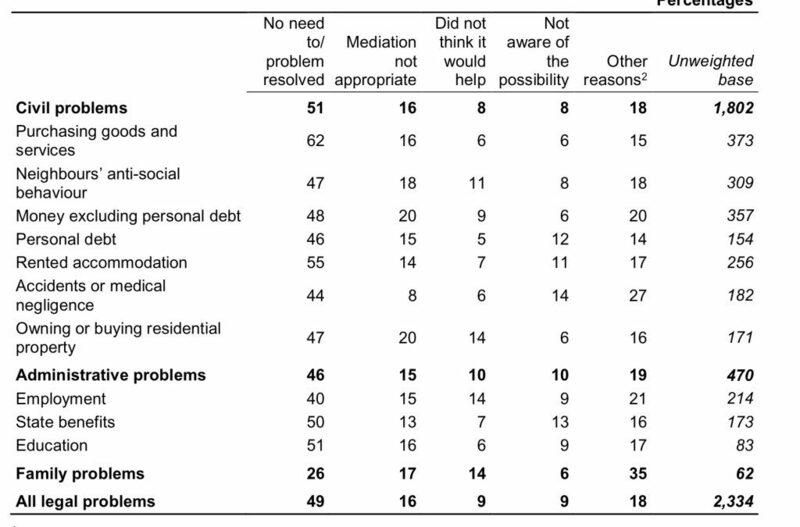 Among adults who had considered using mediation but ultimately did not do so, the most common reason given for not using it was that there was no need for it or the problem had resolved (37%). Among adults who had not considered using conciliation, mediation or arbitration the most common reason was again that there was no need to or that the problem resolved (49%), with 16% saying mediation was not appropriate for resolving their problem. Around one in ten did not think mediation would help (9%) or were not aware of the possibility of using mediation (also 9%). There was some variation by problem type. 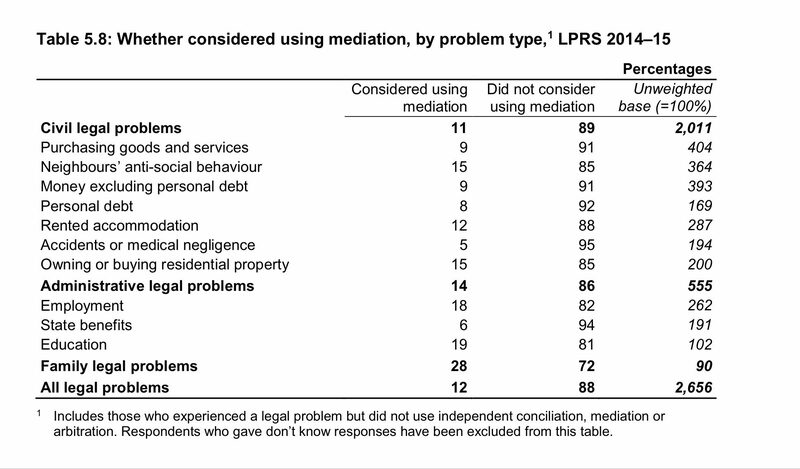 Around a quarter of adults with problems relating to a relationship breakdown (26%) said they had not considered mediation because there was no need to or the problem had resolved, compared with around half of adults with civil legal problems (51%) or administrative legal problems (46%). What conclusion can we draw? Mediation has a long way to go to becoming an alternative way of resolving problems generally. It is most normally considered to be appropriate in relationship breakdown cases. In order to increase mediation use the study would suggest that people’s knowledge about the options need to be increased.